Many companies get into SharePoint for the calendars, because calendaring is tangible and it makes sense on the company, department, and individual level. SharePoint calendars can be displayed as regular calendars, lists, worksheets and Gantt charts with very little customization. Dates can be filtered or calendars can be combined to form the perfect combination into a custom view. Here are three of my favorite calendar tricks. Connecting your SharePoint calendar to Outlook is really very simple. First select the calendar view (as opposed to list or gantt view) of the calendar. Then click on the Calendar Tab at the top of the screen and choose Connect to Outlook. Click ok for a couple of warning messages, and your SharePoint calendar will be listed as another available calendar in Outlook. Once the SharePoint calendar is available in Outlook, you can overlay it on your personal calendar, add, edit, and change events, and copy an event to Outlook. Unfortunately, you cannot overlay filtered views of calendars into Outlook. Events for which you do not have permission to see, will still not show up, and when creating new events, required custom metadata fields from the calendar won’t be filled in until you reopen the new events in SharePoint. With a filtered SharePoint calendar, you can parse a large calendars into smaller calendars based on the custom fields that you enter. For example, the entire company calendar may have hundreds of events per month. Finding the HR specific events could be tedious. Instead of sorting through each event, require a column or metadata field that asks for department. Then, create a custom view that only shows events for the HR. With SharePoint, you can also combine various calendars from different parts of the site into one overlaid calendar. This is also fairly easy to do. I always create a new dummy calendar to host the overlay, since creating the overlay will set the default view for the calendar to include all overlaid calendars. Once you have your dummy calendar and the calendars you wish to overlay in place, navigate to the dummy calendar and choose Calendar Overlay under the Calendar tab. Then click on New Calendar (which is something of a misnomer because clicking on New Calendar doesn’t create a new calendar; It just adds a new calendar to the overlay). In any case, clicking on New Calendar brings up a screen in which you can select the calendar you would like to add. Calendars can be added from any sub-site, or even from exchange. Calendar Overlays are one way to get around the siloed data problem with SharePoint. 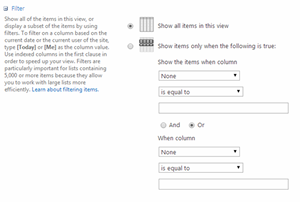 Typically, data within one sub-site is inaccessible from other sub-sites without some SharePoint Designer magic. Using a calendar overlay, you can pull up data from another site. Simply create a dummy calendar, and then overlay the calendar on the other sub-site. Project Management sites are a good example of this. SharePoint 2013 offers easy to use Project Management sub-site templates with Calendars. Many companies want to aggregate these calendars into one master Project Management Calendars. Overlays make this possible. An overlaid calendar combines many smaller calendars, allowing users to see both the smaller calendars and the one large master calendar. Filtered views of calendars do the opposite. Filtered views divide one large calendar into many smaller calendars, allowing users to see both the smaller calendars and the one large master calendar. It sounds like six of one or half dozen of the other, but there are some pros and cons to each arrangement. Outlook integrations- Overlaid calendars and filtered calendars cannot be connected to Outlook. If the smaller sub-calendar is more important and you need to connect to Outlook, use an overlay so that only select events will be pulled in. If the larger overall calendar is more important, then a filtered calendar would be better since that will pull everything into the Outlook view. Metadata- If you are using filtered calendars, then every event will need to have metadata or column data assigned. Events added from Outlook won’t have this metadata and will need to be reopened in SharePoint before filtered views will work. Overlay calendars, on the other hand, use no custom metadata. Colors- Overlaid calendars show the events of each sub-calendar in a different color. Filtered calendars do not. List, Worksheet, and Gantt views- Overlaid calendars can only be viewed as a regular calendar. Filtered calendars can be reorganized into lists. In some cases, information may have dates but may not fit well into a calendar, and a custom list may be better. Ranges of dates- If a project is due in June, the Spring, or after something else happens, then a calendar is probably not the right tool. Tasks- Without getting too philosophical, tasks have due dates but aren’t really calendared events. They can be accomplished at any time during a day, and they usually take up a range of dates. If you check an item off as complete, it fits better in a task list than a calendar. Dates are unimportant- some data has dates, but the dates are unimportant. For example, in a document library, all of the documents were finished at a certain time, but typically, no one cares. A little thought beforehand about the nature of the data will help you choose between overlays and filters, or even if a calendar is needed at all.